Azure Data Catalog is a fully managed cloud service that serves as a system of registration and system of discovery for enterprise data assets. 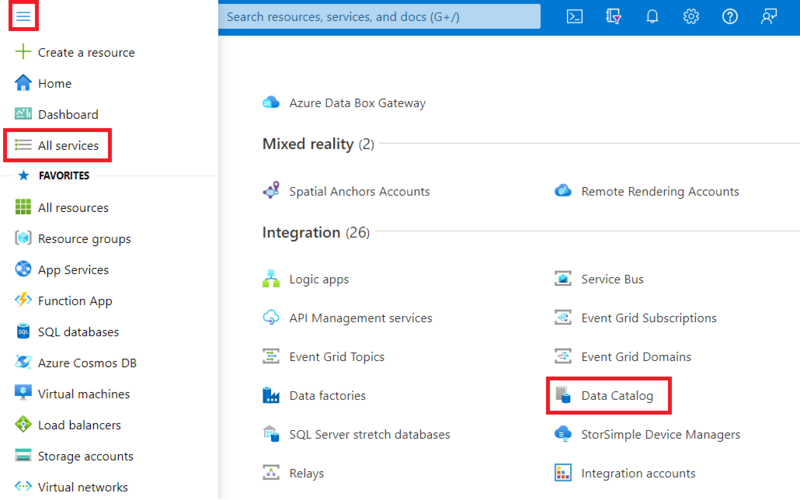 For a detailed overview, see What is Azure Data Catalog. This quickstart helps you get started with creating an Azure Data Catalog. You need to have your own Azure Active Directory tenant. 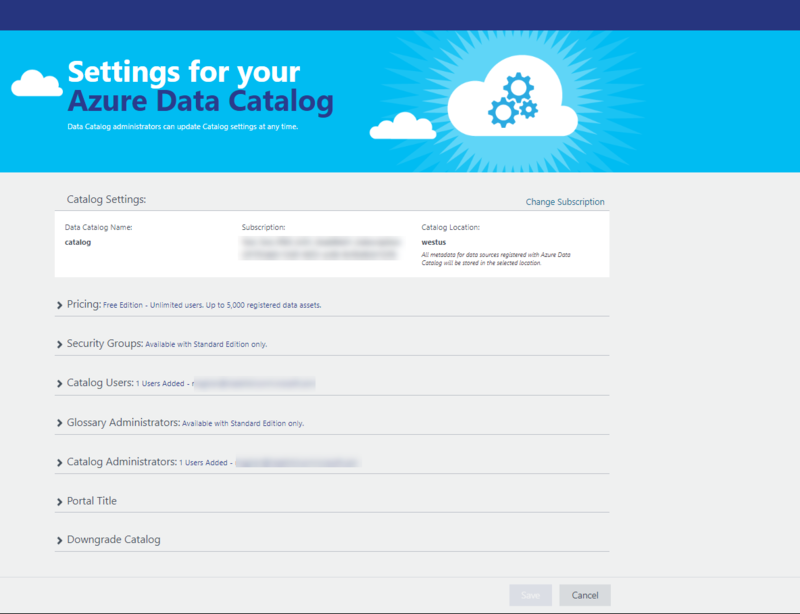 To set up Data Catalog, you must be the owner or co-owner of an Azure subscription. You can provision only one data catalog per organization (Azure Active Directory domain). Therefore, if the owner or co-owner of an Azure subscription who belongs to this Azure Active Directory domain has already created a catalog, then you can't create a catalog again even if you have multiple Azure subscriptions. To test whether a data catalog has been created by a user in your Azure Active Directory domain, go to the Azure Data Catalog home page and verify whether you see the catalog. If a catalog has already been created for you, skip the following procedure and go to the next section. 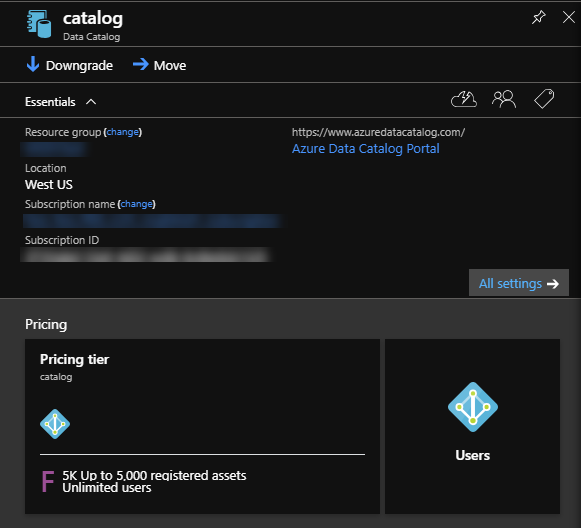 Go to the Azure portal > Create a resource and select Data Catalog. Specify a name for the data catalog, the subscription you want to use, the location for the catalog, and the pricing tier. Then select Create. Go to the Azure Data Catalog home page and click Publish Data. You can also get to the Data Catalog home page from the Data Catalog service page by selecting Get started. Expand Pricing and verify your Azure Data Catalog edition (Free or Standard). If you choose Standard edition as your pricing tier, you can expand Security Groups and enable authorizing Active Directory security groups to access Data Catalog and enable automatic adjustment of billing. Expand Catalog Users and click Add to add users for the data catalog. You're automatically added to this group. If you choose Standard edition as your pricing tier, you can expand Glossary Administrators and click Add to add glossary administrator users. You're automatically added to this group. Expand Catalog Administrators and click Add to add additional administrators for the data catalog. You're automatically added to this group. Expand Portal Title and add additional text that will be displayed in the portal title. Once you complete the Settings page, next navigate to the Publish page. On a separate tab in the web browser or in a separate web browser window, go to the Azure portal and sign in with the same account that you used to create the data catalog in the previous step. Select All services and then click Data Catalog. You see the data catalog you created. Click the catalog that you created. You see the Data Catalog blade in the portal. You can view properties of the data catalog and update them. For example, click Pricing tier and change the edition. In this quickstart, you've learned how to create an Azure Data Catalog for your organization. You can now register data sources in your data catalog.